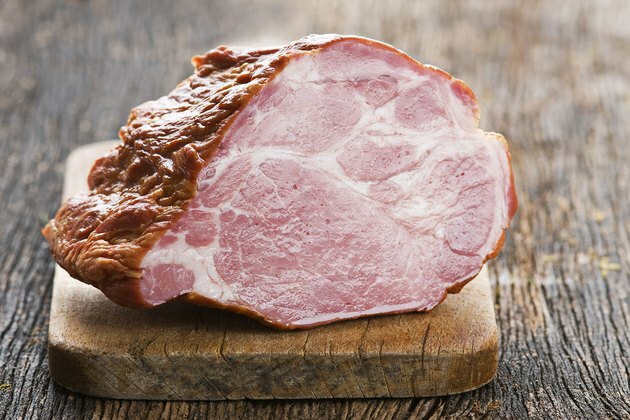 With a precooked ham, the purpose of cooking is to heat the meat through while adding flavor. Because the meat is already cooked, over-cooking can leave your ham dry. A Crock Pot slowly cooks the ham and keeps the meat moist while infusing flavors, such as brown sugar or tropical fruits. 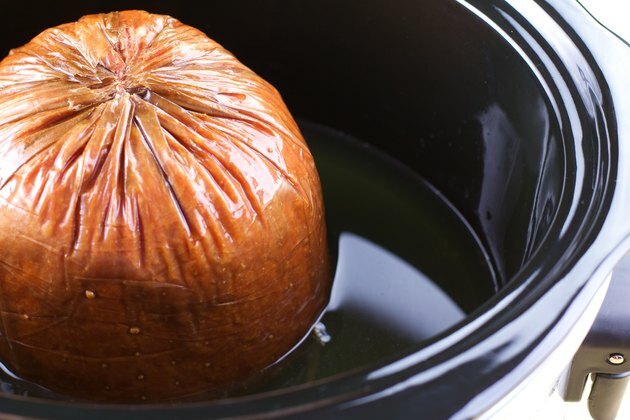 With the addition of a few other ingredients, a Crock Pot allows you to cook the ham throughout the day, leaving your oven available for side dishes. Place the precooked ham into the Crock Pot. If you have a half ham or spiral-cut ham, place the flat end of the ham down. Place the lid on top to ensure that there is enough room for the lid to seal. If the lid will not seal, trim the ham as needed. Add enough liquid to create a 1-inch bath at the bottom of the Crock Pot. You can use water, cola or fruit juice. Add any fruits, spices or brown sugar you desire to the liquid or directly onto the ham. Place the lid on the Crock Pot and cook for six to eight hours on the low setting or until the internal temperature of the precooked ham reaches 140 degrees Fahrenheit with a meat thermometer. 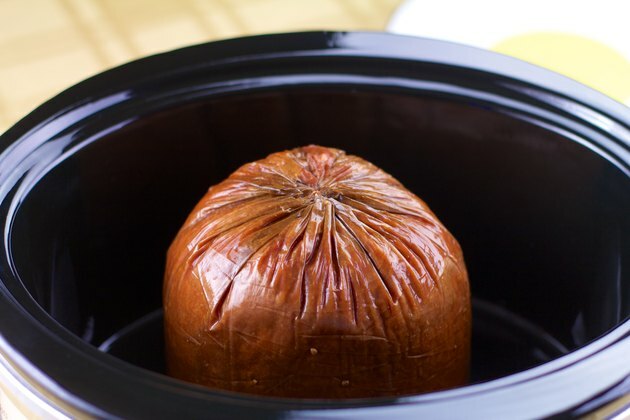 When choosing a ham to cook in the Crock Pot, it is important to check the ham will fit into your Crock Pot and allow the lid to seal. If you are unsure, use a measuring tape to measure the inside of your Crock Pot before buying a ham. Take the tape measure with you to the store and measure the ham before you buy it. 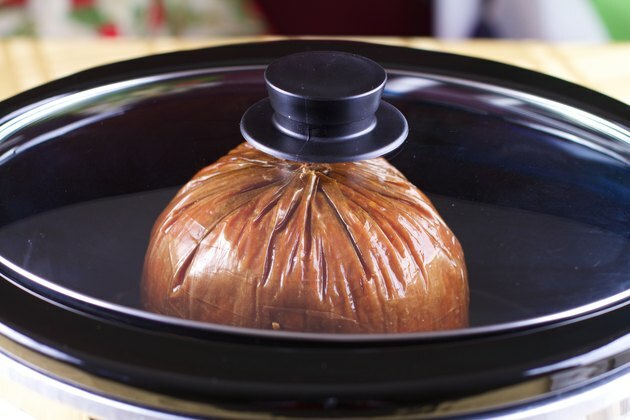 When you cook with a slow cooker, steam builds up inside and creates additional moisture. Because of this, flavors or spices may become watered down. To maintain the flavor you desire, you may need to add additional spices or fruits. Consider adding complementary vegetables, such as sweet potatoes or carrots, to the slow cooker. These will add flavor to your ham. Because vegetables cook more slowly than meat in a Crock Pot, place the vegetables on the bottom and around the sides. If cooking at high altitudes, extend the cooking time by about an hour. Use less liquid if cooking at altitude.